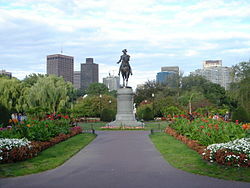 Boston Public Gardens first opened to the community in 1837. From the beginning, the botanical garden was decorated with beautiful flowers to enliven the spirit, which it still does today for many Boston visitors. With tranquil meandering paths and floral exquisites of all kinds, the Public Garden has a long history of treating Boston visitors to showy annuals and greenhouse plants that vividly display breathtaking colors and structure. The Victorians ushered in Boston Public Gardens and today the attraction features most of the same garden art that some critics find brash but many Boston visitors truly adore. When you’re spending the holidays in Boston, you’ll find some amazing seasonal flowers and trees at the Gardens, as well lovely monuments, fountains, and even a lagoon that hosts Swan Boat races. More than 80 species of plants are cultivated in the Public Gardens’ greenhouses, by the Boston Parks and Recreation Department, which are used for future plantings in more than 50 other locations in the city. Take a peak into life in the late 1700’s at Revere House, the former residence of Paul Revere located on the Freedom Trail’s North End. Visiting the Revere House is one of the most treasured Boston holiday activities because the house takes on a picture-postcard atmosphere that is a perfect example of the Boston homes in Revere’s time. If you love history, you’ll enjoy getting an up-close-and-personal look at this revolutionary character by viewing unique period pieces, such as fine silver, inside. Revere House has become a National Historic Landmark in Boston since Revere’s infamous ride from this small wooden home on 1775. Revere House is downtown Boston’s oldest building, and one of the only buildings of its kind remaining today that gives us a glimpse into colonial America. Revere House was built in approximately 1680, on the site of the former parsonage of the Second Church of Boston. The Minister of the Second Church and his family lived in the home until it was destroyed by fire in 1676. A new home was built on the same ground 4 years later.